Lawmakers Reach A Deal To Expand Regulation Of Toxic Chemicals : The Two-Way If it passes, the compromise bill would be the first update to the Toxic Substances Control Act in more than four decades. Supporters say it gives the EPA more power to ensure chemical safety. 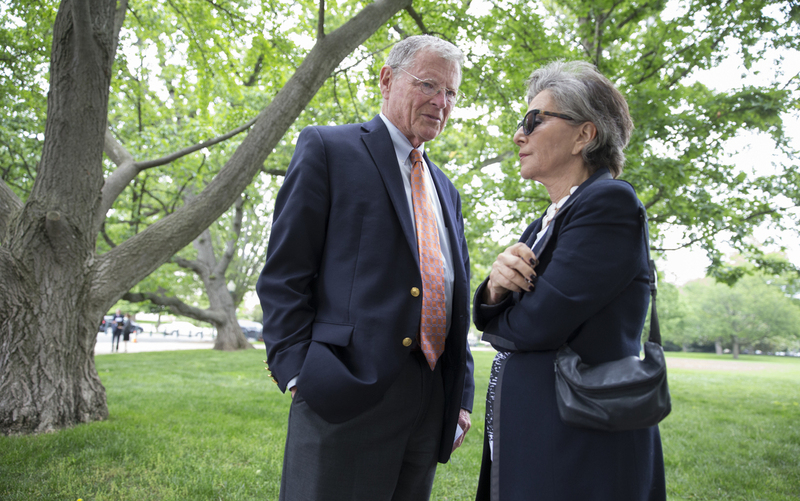 Environment and Public Works Committee Chairman Sen. James Inhofe, R-Okla., speaks with Sen. Barbara Boxer, D-Calif., on Thursday before joining a bipartisan group of senators at a Capitol Hill news conference to discuss legislation to improve the federal regulation of chemicals and toxic substances. The bipartisan legislation would update the Toxic Substances Control Act, which became law in 1976. The original act gave the Environmental Protection Agency the authority to require testing and reporting of potentially harmful chemicals. "It assumed that thousands of untested chemicals already in use were safe. "The new legislation, if it becomes law, would require the EPA to begin evaluating those untested older chemicals. It would also allow federal regulations to pre-empt those adopted by states, even if the state regulations are more stringent." The compromise bill — which the House and Senate are expected to vote on as soon as next week — is not universally supported. A group of House Democrats said in a statement that the legislation is "significantly weaker" than a previous House version of the bill as well as the 1976 law. But backers say the final measure will significantly strengthen the decades-old regulation. "We have really a great bill here," James Inhofe, chairman of the Senate Environment and Public Works Committee, said at a news conference Thursday. The Oklahoma Republican noted that it has been backed both by industry and by environmental groups such as the Environmental Defense Fund. "I wish I had the option to write the bill on my own. Believe me, it would have been much stronger," Democratic Sen. Barbara Boxer of California said Thursday. "But I know if we want to make progress, we need to reach across the aisle. And as long as this is progress over the current situation, I am supporting it." Inhofe says he hopes the legislation will be delivered to President Obama before the Memorial Day recess.